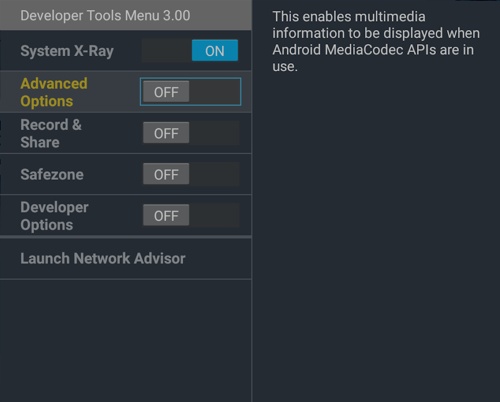 System X-Ray is a tool that helps internal and external developers identify app or system problems on Amazon Fire TV devices. System X-Ray gathers instantaneous system metrics and displays on top of the screen as an overlay. When toggled on, the overlay will always visible on the screen, even when users run applications, such as playing video or games. System X-Ray is available on all Amazon Fire TV and Fire TV Stick devices with Fire OS version 5.0.2 and higher. Remote Control: On the directional pad, press and hold the center and down together (simultaneously) for 5 seconds; then release the buttons and press the remote's menu button. Amazon Game Controller: Press and hold A and Y buttons together (simultaneously) for 5 seconds; then release the buttons and press the controller's menu button. After the Developer Tools Menu dialog box appears, toggle System X-Ray On. HDMI Mode: Shows the physical height of display in pixels and the refresh rate in frames per second. For example, if the Display shows "1080p 60," it means 1080 pixels is the physical height of the display, and 60 is the refresh rate in frames per second. HDCP: Shows the HDCP (High-bandwidth Digital Content Protection) version used by Amazon Fire TV to encrypt content that is sent through the HDMI cable to the television. Note that Amazon Fire TV allows users to change their resolution by going to Settings > Display & Sounds > Display > Video Resolution. However, regardless of the resolution users select, an app can change the user's selected resolution due to network or system resource reasons to give users a better experience. For example, when the YouTube app plays video, if your network connection is slow, the app might lower the resolution to ensure the playback is still smooth. Note: The Display (DIS) module is not available on Fire TV Edition. If an Amazon Fire TV device only has two cores (as with the Fire TV Stick), only two columns will appear. CPU utilization can help identify CPU-intensive apps. A core that shows consistently heavy usage may indicate a need to make a process multi-threaded. Foreground App Memory (blue): App — shows the memory usage (specifically, the Proportional set size (PSS) of the foreground application, not the GPU memory) and the package name of the foreground app. The package name of the foreground app is displayed below the bar. If you're on the home screen, com.amazon.tv.launcher appears as the app name. Other memory (gray): Other — shows the memory usage by other applications. Available memory (white): Available memory — shows the available (free) memory in the device. In this example, 44.7 MB of memory is used by the Amazon Fire TV launcher, 744.8 MB is used by the whole system, and 849.3 MB is still available. RSSI (Received Signal Strength Indicator): Shows how strong the WiFi signal is, measured in dBm (value of radio signal). The bar indicates the signal strength and is color-coded using the same color coding scheme as the CPU section to indicate the severity of a problem (green is strong, orange is average, and red is weak). The number is always negative – with better signal strength, the number moves closer to 0. If the Amazon Fire TV has a wired connection and is not using WiFi, RSSI is not shown. System: Measures how many bits per second are being actively downloaded to the device (including both visible and background apps). This is not the available bandwidth. If 0 bps is displayed, no data is being downloaded at the moment. Visible: Measures how many bits per second are being actively downloaded by the visible (also called foreground) app. This number will never be higher than the system download speed.